This is an image I took a long time ago with a film camera. And I probably toned it in sepia toner – or maybe I overlaid the scanned image with colour in Photoshop. I don’t recall because it was all a long time ago. But one thing I remember and that I have to ‘fess up’ to is that I used the ‘swirl’ tool in Photoshop to give the tree a bit more twist. The tree reminds me of a stick-thin old gentleman holding his arms up. Or maybe a woman holding her hairdo in place. I can see it, when I look at the fence behind it. Didn’t notice until I’d read about the swirl. Is the the same tree as in the sheep photograph? It’s a different tree and I have been trying to recall where it was but it’s murky and I can’t place it. Even writing this now is setting off little sparks of memory. Oh David, she’s a wonderful Old Crone! 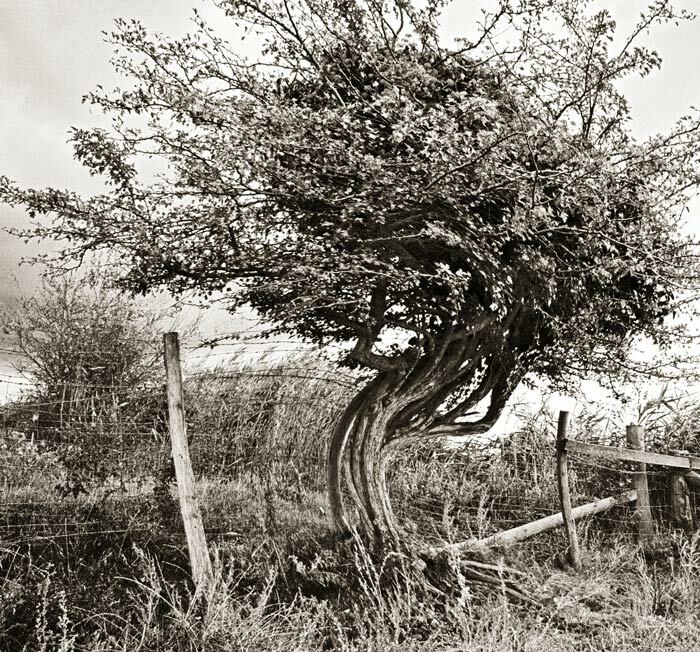 Just like the rest of her kind; standing stubbornly against the winds of time, nay LEANing into the future; a symbol of Nature’s determination, her drive to survive?